Students from the third generation of Latino Roots classes share their thoughts and experiences with the class. It has been a busy spring for Latino Roots! Since our last update, the panels traveled to Eugene 4J Awbrey Park Elementary School, where they were installed for 2 ½ months and central to two events: a Latino Parents Night, and a Multi-cultural Night. Panels were installed in the cafeteria as well as the main office, and were well received by the campus community. In addition to installing the panels in the main entryway, our project coordinator was present to hand out flyers, booklets, and answer questions. In March, the Latino Roots Panels were on display at Eugene 4J Kelly Middle School’s annual Benito Juarez Celebration. Pictured here are José Luis Sámano and Ema Pérez in front of their panel with family members. The event is a well-attended celebration with food, music, and a community vibe. After the event, the panels were installed throughout the school where they are viewable by the school community throughout the school week, and will remain in place for several more weeks. Half of the panels are installed near the Spanish block classrooms, where immersion teachers are working with students to engage the panels. A partial installation of the Latino Roots Panels also continues to travel with Oportunidades coordinator Antonio Huerta. So far this year, the panels have been seen by over 450 students in Salem, Portland, and Woodburn. In addition to traveling the panels, our Latino Roots Project Coordinator has been tabling at many events, and is beginning to meet with groups to talk about the project. In March, our coordinator was invited to speak in a Qualitative Methods class at the University of Oregon about the project, sharing both the message and the importance of the method. In late April she will meet with GANAS Leadership Students at Kelly Middle School to facilitate a conversation about the information in the panels. Finally, the Latino Roots Panels themselves have been viewed by well over 50,000 people throughout the state, and are showing significant wear and tear. As a result, we are in the process of preparing them for reprint by the end of this academic year. The new panels will be printed on a canvas banner, and we will be adding new panels using information from the Latino Roots Archives, housed in Special Collections at the University of Oregon. To book the panels, provide feedback, or brainstorm ideas about how you or your organization can utilize the project, please contact Latino Roots Project Coordinator Tamara LeRoy at cllasprojects@uoregon.edu. Since our spring 2015 update, the Latino Roots traveling display has been to Medford, Cottage Grove, Salem, Eugene, and Springfield, reaching over 50,000 people in viewership since the project began in 2010. Although CLLAS is closed during summer months, we were also able to coordinate several hosting opportunities through volunteer efforts. One set of panels circulated in Salem throughout the summer, and the other set stayed in the Eugene/ Springfield area and circulated for short-term events such as art walks and festivals. At South Medford High School, where the display was hosted for over two months, feedback from administration indicated that engagement with the project was high, and the display was well received by students, administration, and the community on the whole. SMHS has a student population of approximately 1,800 students, with activities every weekend bringing hundreds of family and community members for plays, concerts, and sporting events. Leadership students at South Medford High School arranged the panels in the school’s grand entry as a self-guided tour. Eugene’s Awbrey Park Elementary School is hosting a full set of panels through late January to complement the school’s Latino Parent Night and a multicultural night. A partial display is circulating with the UO Opportunities Program (opportunities.uoregon.edu). In response to increased community interest and engagement, CLLAS will draw on funds donated by SELCO Community Credit Union to create a new set of lightweight traveling panels, intended for short-term installation at community events such as art walks, health fairs, celebrations, lectures, and more. Additionally, CLLAS plans to use the Latino Roots Digital Archives, housed at the UO, to create several new panels. Currently, CLLAS staff is analyzing the archival materials created by three generations of the Latino Roots class (2011, 2013, 2015) for potential content. 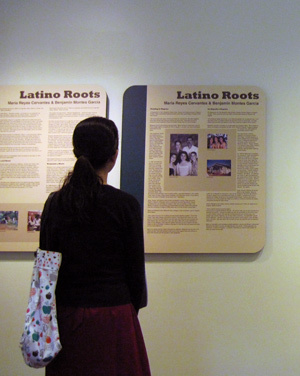 By connecting the traveling display with the Latino Roots class and Digital Archives, the Latino Roots Project is able to serve as an educational tool for institutions and communities throughout Oregon. If you would like to book our traveling display for your organization, or for more information about the project, please contact Latino Roots Project Coordinator, Tamara LeRoy, at (541) 346-5286 or tleroy@uoregon.edu. The Latino Roots in Oregon panels are on display at Springfield High School during the months of October–December 2011. These fifteen portable wooden panels contain photographs and stories about seven immigrant families, which are bilingual in Spanish and English. The panels were on display for more than a year at the Lane County Historical Museum (January 2009 through March 2010), and were part of the exhibit “Changing Demographics: The People of Lane County.” The Latino Roots panels feature a timeline of Latino presence in what is now the state of Oregon beginning in the 1700s, maps, demographic information, information about Latino youth, and the stories of seven families who came at different times to Lane County from California, Texas, Mexico, Guatemala, El Salvador, and Chile. A research team led by CLLAS director Lynn Stephen (Anthropology, Ethnic Studies) created the panels. The team included Gabriela Martínez, Patricia Cortez, Guadalupe Quinn, Mauricio Magaña, Sonia de la Cruz, Kate Williams, Lukacs Nguyen, and Magali Morales. 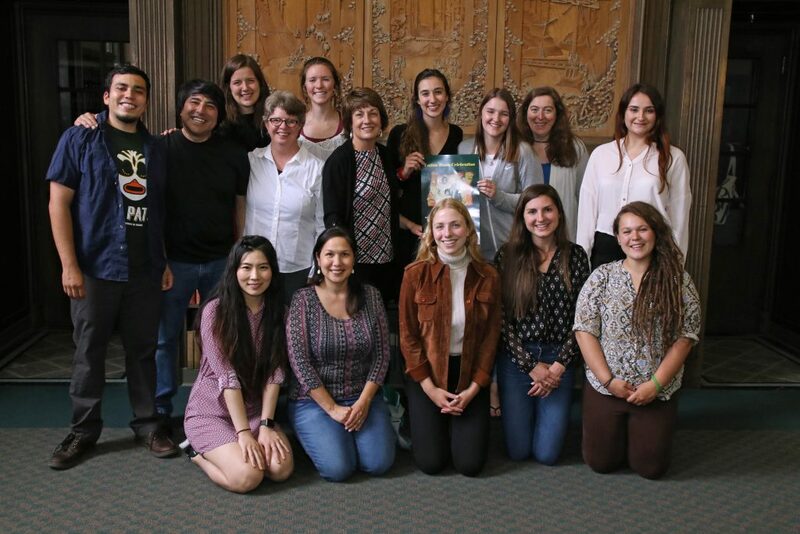 The Latino Roots Project is administered through the Center for Latino/a and Latin American Studies (CLLAS) and is a part of the “Americas in a Globalized World: Linking Diversity and Internationalization” big idea at the University of Oregon. Selco Community Credit Union is the community sponsor. 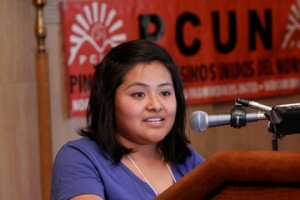 Lidiana Soto speaks at the special event marking the PCUN-UO partnership (photo by Jack Liu). Eugene, Oregon: June 6, 2011—My name is Lidiana Soto. I’m a graduating senior at the University of Oregon majoring in Ethnic Studies and Political Science. I had the opportunity to be a student in the Latino Roots courses that produced the videos you’re about to see on display upstairs in Special Collections [Latino Roots student documentaries]. Our Latino Roots courses brought together a group of 18 students over two quarters. During Latino Roots I, taught during winter quarter we learned about the racial/ethnic history of Oregon since more than 500 years ago and the place of Latino and Latin American history in that larger story. We also learned how to conduct oral history interviews and how to work a video camera. We each identified an individual or family whose story we have documented. We recorded an audio interview and then also a video interview. This quarter, during Latino Roots II, we learned how to shoot and edit our videos and each have produced an original ten minute documentary which we are going to present today. We are also archiving the audio file, video, a transcript, and finished video with the University of Oregon Libraries, Special Collections & University Archives. We are, literally, making history [See story on CLLAS website]. This project began in conjunction with the brainstorming of an exhibit being planned for the Lane County Historical Museum around the celebration of the Oregon sesquicentennial in 2009. “Changing Demographics: The People of Lane County” offered an opportunity to introduce the voices of groups not previously well-represented at the museum, and included panels on Native Americans, Jewish communities, Asian immigrants, African American history, and Latino Roots. Dr. Lynn Stephen, distinguished professor of anthropology at the University of Oregon, directed the creation of the original seventeen panels used in the Latino Roots portion of the exhibit, teaming up with associate professor Gabriela Martínez from the School of Journalism and Communication, students, and community activists. Professor Martínez produced and directed the documentary “Latino Roots in Lane County,” which was part of the exhibit. The panels and the documentary inspired additional projects, which Dr. Stephen began developing with Dr. Martínez. Latino Roots in Lane County, Oregon: Exhibit Panels: On display for more than a year at the Lane County Historical Museum (January 2009 through March 2010), these seventeen bilingual (Spanish/English) panels (approximately three feet wide and five feet tall) were part of the exhibit “Changing Demographics: The People of Lane County.” The Latino Roots panels feature a timeline of Latino presence in what is now the state of Oregon beginning in the 1700s, maps, demographic information, information about Latino youth, and the stories of nine families who came at different times to Lane County from California, Texas, Mexico, Guatemala, El Salvador, and Chile. A research team led by CLLAS director Lynn Stephen (Anthropology, Ethnic Studies) created the panels. The team included Gabriela Martínez, Patricia Cortez, Guadalupe Quinn, Mauricio Magaña, Sonia De La Cruz, Kate Williams, Lukacs Nguyen, and Magali Morales. Booklet: The 33-page bilingual “Latino Roots: In Lane County, Oregon/ Raíces Latinas del Condado de Lane, Oregon” booklet is available for download on the CLLAS website and for purchase at the University of Oregon Bookstore. It reflects the content of the original seventeen panels and can be used with classes who view the panels. Documentary: “Latino Roots in Lane County: Contemporary Stories of Settlement in Lane County, Oregon” is a 33-minute bilingual documentary that uses in-depth interviewing in the tradition of Latin American testimonio and oral history and was made in conjunction with the museum exhibit. It includes video interviews with six of the families featured in the Latino Roots exhibit panels. Producer and Director: Gabriela Martínez. Assistant Producer: Sonia De La Cruz. Research Team: Lynn Stephen, Gabriela Martínez, Mauricio Magaña, Lukacs Nguyen, Sonia De La Cruz, Guadalupe Quinn. Spanish and English with subtitles. Latino Roots in Lane County projects were co-sponsored by the Center for Latino/a and Latin American Studies and the Center for the Study of Women in Society. “Latino Roots in Oregon” is the working title of a 52-minute documentary by associate professor Gabriela Martínez, doctoral student Sonia de la Cruz, and local community activist Guadalupe Quinn. The film will be suitable for public television viewing and DVD and Web-streaming distribution. Currently in production phase, this 2009-2010 CLLAS grant-winning project addresses the important but often neglected history of Latin American and Latino settlement in Oregon. Some came driving cattle with early ranch pioneers along the Siskiyou Trail, some came as mule packers for the U.S. Army, some were Basque sheepherders from the Spanish Pyrenees, and some joined the Bracero Program during WWII and worked the fields and orchards providing manual labor. 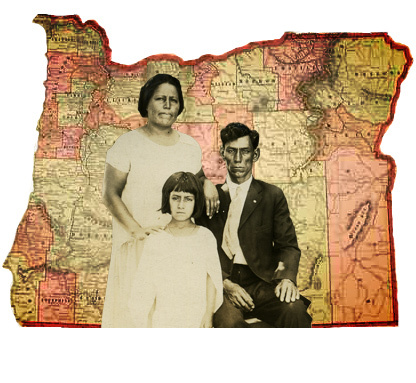 The ways and times Latinos made their way to Oregon are many and varied and provide for rich story telling as well as a databank for historical purposes. “Latino Roots in Oregon” is based on extensive research and uses archival materials and in-depth journalistic and ethnographic interviews. An open-access digital archive is part of the overall research project and an important derivative of the fieldwork for the documentary. The archive encompasses moving images, still photographs, documents and text that work together to tell the stories of Latin American and Latino historic and contemporary settlers who call Oregon home. It will be housed in UO Libraries Digital Collections.